Mechanicsburg’s Lani Wilhelm (10), sporting a new mask to protect her recently-broken nose, turns the corner on a dribble drive Thursday night against Southeastern. 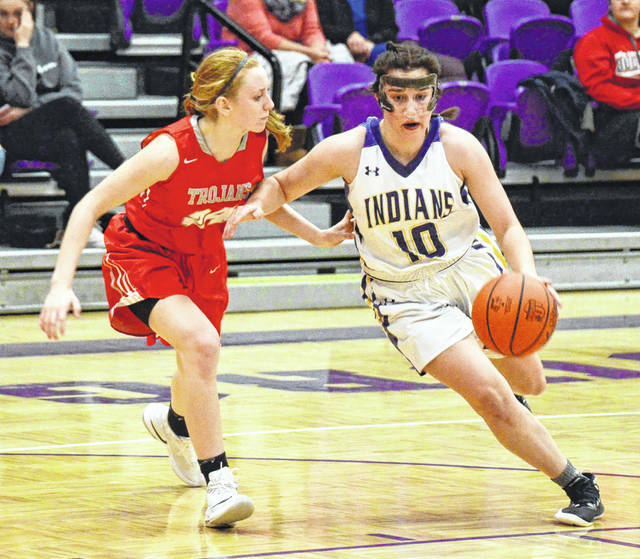 MECHANICSBURG – The Indians used their swarming defense to suffocate Southeastern and beat the Trojans, 43-28, in OHC girls basketball on Thursday. If Mechanicsburg could have made a shot through three quarters, the Indians would have routed the visitors. Mechanicsburg shot 11-of-46 (24 percent) for the game, and only 6-of-40 (15 percent) until the final period. “We didn’t play well, although we hit a couple of threes. That kind of started us, but then our main focus was to get the ball inside, because we felt like we had an advantage there,” MHS Coach Christie Dodane said. Despite the rough start, the Indians allowed just two points in the second quarter and took a 19-9 lead into the break. But coming out of halftime, Mechanicsburg took nearly three minutes to score its first point and turned the ball over constantly. “At times, we looked like we didn’t know what to do with the ball. If we didn’t have someone to pass it to right away, we got a little nervous. But I felt like we did a good job keeping our composure and not giving up,” Dodane said. The Indians (9-6, 7-3) finally turned things around in the fourth quarter, going 5-for-6 from the field and hitting bonus free throws to nearly match the team’s offensive output from the first three quarters combined. Morgan Hamby led the Indians with 19 points and Grace Forrest scored 11. With seven minutes remaining, Southeastern was able to trim the lead to just a single point with a pair of treys and some more sloppy offense from the Indians, but Dodane didn’t panic and neither did the team. “In the fourth quarter, I knew I had to, not get on them, but boost them up. That was my focus. And the kids responded. And then we continued to get it inside and Hamby played really well,” Dodane said. In the jayvee game, Southeastern won, 26-7. Mechanicsburg plays at West Liberty-Salem on Saturday – weather permitting. https://www.urbanacitizen.com/wp-content/uploads/sites/36/2019/01/web1_LaniWilhelm011719_ne2019117195610484.jpgMechanicsburg’s Lani Wilhelm (10), sporting a new mask to protect her recently-broken nose, turns the corner on a dribble drive Thursday night against Southeastern.